Trading ended with 13 securities changing hands, against 15 on Thursday on the Trinidad & Tobago Stock Exchange, on Friday, leading to 3 stocks rising, 3 declining and 7 remaining unchanged. 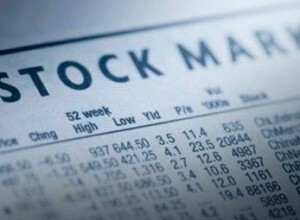 At the market’s close, Composite Index fell 0.98 points to 1,328.64. 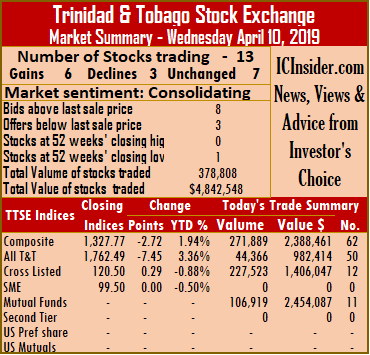 The All T&T Index declined 1.60 points to 1,761.73, while the Cross Listed Index inched down by 0.05 points higher to close at 120.85. 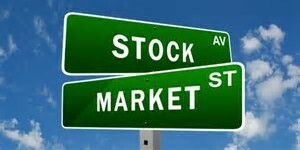 At the close, investors exchanged 102,669 shares at $1,954,012, compared to 73,463 shares at $1,473,525 on Thursday. LJ Williams B Share ended trading at 52 weeks’ high of 89 cents. IC bid-offer Indicator|The Investor’s Choice bid-offer ended at 5 stocks with bids higher than their last selling prices and 3 with lower offers. At the close of the market, stocks ending with gains| LJ Williams B share rose 11 cents and ended at a 52 weeks’ high of 89 cents, after exchanging 1,000 shares. Massy Holdings closed with a gain of 4 cents at $53.20, after trading 257 shares and One Caribbean Media gained 5 cents and ended at $10.15, after 7,300 shares changed hands. Stocks closing with losses| Clico Investments concluded trading with a loss of 25 cents at $23, with 41,506 stock units changing hands, First Citizens lost 47 cents to close at $36.53, after exchanging 660 shares and JMMB Group closed with a loss of 1 cent at $1.75, after trading 14,244 shares. Stocks closing firm| Ansa Mcal settled at $55.24, with an exchange of 100 units, First Caribbean International Bank settled at $8.35, with 250 units changing hands, National Enterprises completed trading of 1,000 stock units at $6.80. 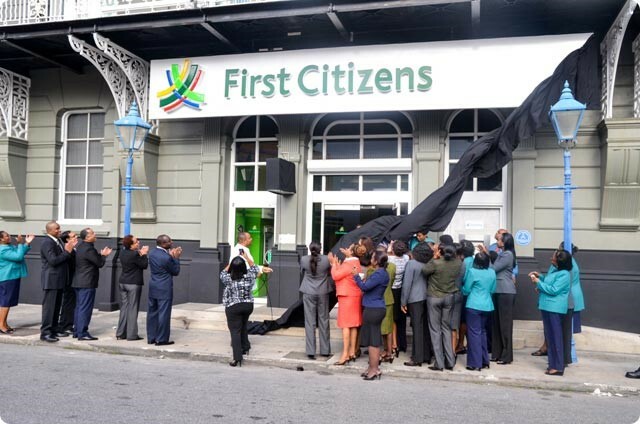 NCB Financial Group closed at $8.25, exchanging 1,781 shares, Sagicor Financial ended at $8.80, after trading 7,837 shares, Trinidad & Tobago NGL settled at $29.40, with 24,924 units crossing through the exchange and Unilever Caribbean ended at $26.30, after exchanging 310 shares. 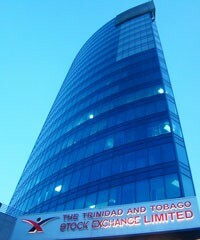 Trading ended with 15 securities changing hands, against 16 on Wednesday on the Trinidad & Tobago Stock Exchange, on Thursday, leading to 5 stocks rising, 2 declining and 8 remaining unchanged. 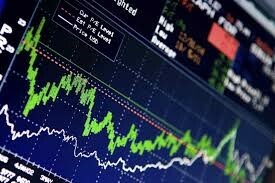 At the market’s close, Composite Index rose 1.85 points to 1,329.62. The All T&T Index gained 0.84 points to 1,763.33, while the Cross Listed Index inched 0.40 points higher to close at 120.90. 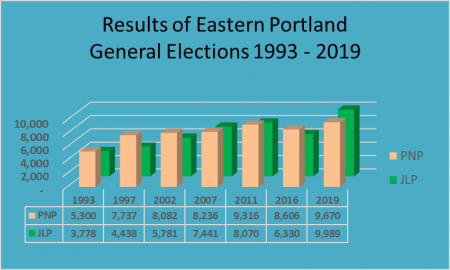 At the close, investors exchanged 73,463 shares at $1,473,525, compared to 378,808 shares at $4,842,548 on Wednesday leaving, First Citizens, Grace Kennedy and Clico Investments to end trading at 52 weeks’ highs. IC bid-offer Indicator|The Investor’s Choice bid-offer ended at 9 stocks with bids higher than their last selling prices and 3 with lower offers. At the close of the market, stocks ending with gains| Clico Investments gained 25 cents and ended at a 52 weeks’ high of $23.25, with 41,000 stock units changing hands, First Citizens concluded trading 1,299 shares with a rise of 47 cents to a 52 weeks’ high of $37. Grace Kennedy added 5 cents and ended at a 52 weeks’ high of $3.35, with 100 stock units changing hands, Sagicor Financial increased 30 cents to $8.80, after exchanging 6,000 shares and Unilever Caribbean rose 5 cents and ended at $26.30, after trading 735 shares. 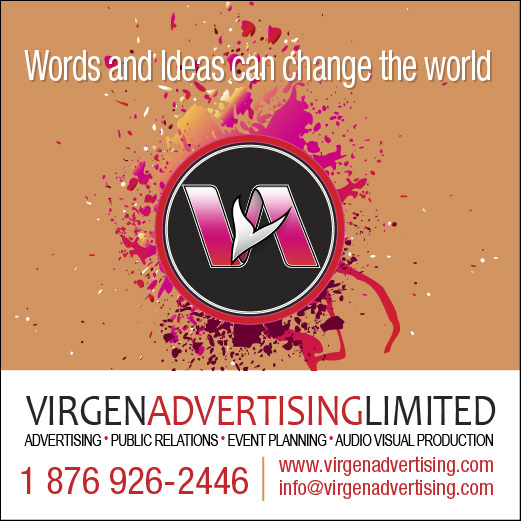 Stocks closing with losses| Republic Financial Holdings fell 33 cents and settled at $119.92, after exchanging 553 shares and Scotiabank lost 1 cent to end at $63, with 1,837 stock units changing hands. 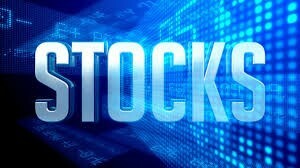 Stocks closing firm| Angostura Holdings ended at $16, with 10 stock units changing hands, Calypso Macro Index Fund traded 220 shares to close at $15, First Caribbean International Bank completed trading of 7,208 units at $8.35, Guardian Holdings closed at $18.50, after exchanging 3,000 units. 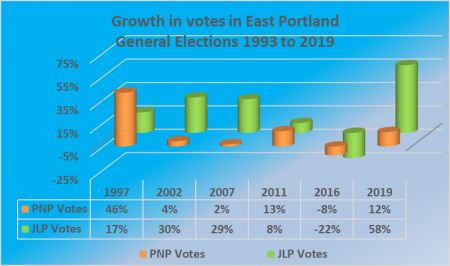 JMMB Group exchanged 270 shares at $1.76, National Enterprises ended at $6.80, with 551 stock units changing hands, NCB Financial Group settled at $8.25, after exchanging 10,000 shares and Trinidad & Tobago NGL completed trading with 680 units at $29.40. 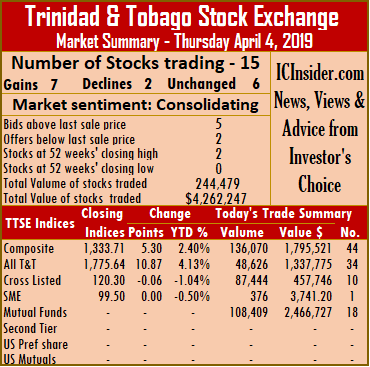 Trading on the Trinidad & Tobago Stock Exchange picked up, on Wednesday, with investors exchanging 378,808 shares at $4,842,548, compared to 247,862 shares for $2,016,105 on Tuesday. Trading ended with 16 securities changing hands, against 13 on Tuesday and ended with 6 stocks rising, 3 declining and 7 remaining unchanged as the volume and value of trades rose from that on Tuesday. At the market’s close, Composite Index lost 2.72 points on Wednesday to 1,327.77. 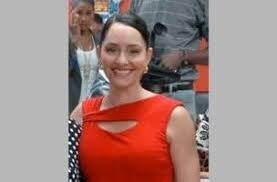 The All T&T Index fell 7.45 points to 1,762.49, while the Cross Listed Index gained 0.29 points to close at 120.50. At the close of the market, stocks ending with gains| Calypso Macro Index Fund traded 1,100 shares and gained 50 cents to close at $15, First Caribbean International Bank closed with a gain of 10 cents while trading of 2,300 units at $8.35, First Citizens gained 3 cents and settled at $36.53, after exchanging 8,084 shares. Massy Holdings gained 11 cents to close at $53.16, in exchanging 908 shares, NCB Financial Group traded 17,372 shares after increasing 1 cent to close at $8.25 and Republic Financial Holdings ended trading with a rise of 25 cents to settle at $120.25, after exchanging 410 shares. Stocks closing with losses| National Enterprises fell 45 cents and ended at 52 weeks’ low of $6.80, with 100 stock units changing hands, Sagicor Financial closed with a loss of 30 cents at $8.50, after exchanging 130,100 shares and Trinidad & Tobago NGL shed 9 cents and completed trading with 17,443 units at $29.40. Stocks closing firm| Ansa Mcal completed trading at $55.24, with 40 units trading, Clico Investments ended at $23, with 106,319 stock units changing hands, Guardian Holdings completed trading of 500 units at $18.50, JMMB Group closed at $1.76, after exchanging 77,751 shares. 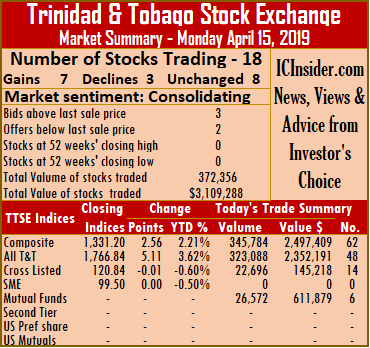 Scotiabank ended at $63.01, with 100 stock units changing hands, Trinidad Cement settled at $2.60, after exchanging 16,631 shares and West Indian Tobacco ended at $98.75, with 150 stock units changing hands. 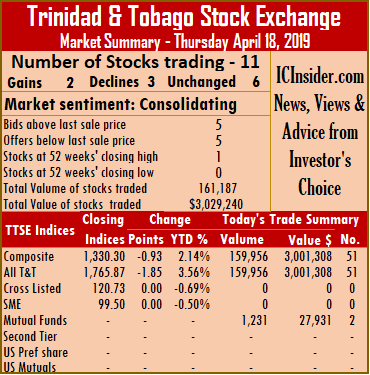 Trading on the Trinidad & Tobago Stock Exchange ended with 3 stocks rising, 2 declining and 8 remaining unchanged as the volume and value of trades rose from that on Monday. 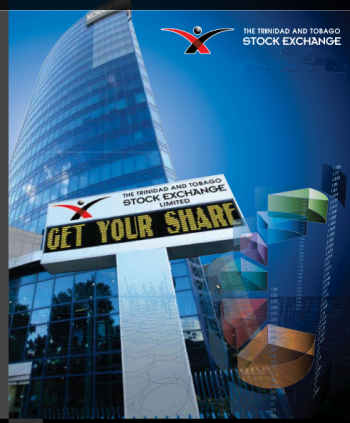 Trading ended with 13 securities changing hands, against 12 on Monday with investors exchanging 247,862 shares at a value of $2,016,105, compared to 81,849 shares at a value of $1,592,860 on Monday. 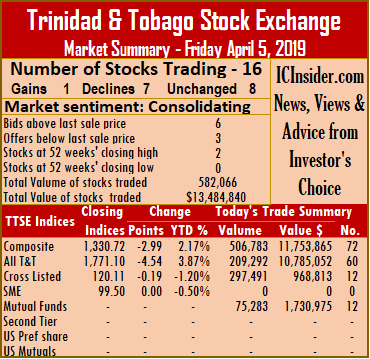 At the close of the market, stocks ending with gains| Sagicor Financial gained 10 cents to close at $8.80, after exchanging 8,561 shares, Scotiabank added 1 cent and ended at $63.01, with 1,550 stock units changing hands and West Indian Tobacco climbed at $1.75 to end at $98.75, trading 1,620 stock units. Stocks closing with losses| National Flour lost 2 cents and completed trading with 500 units at $1.63 and Unilever Caribbean declined 5 cents to $26.25, after exchanging 13,035 shares. Stocks closing firm| Ansa Mcal completed trading at $55.24, with 1,000 units, Clico Investments ended at $23, with 1,240 stock units changing hands, First Caribbean International Bank completed trading with 40,000 units at $8.25, First Citizens settled at $36.50, after exchanging 6,017 shares. Guardian Holdings completed trading with 1,764 units at $18.50, JMMB Group closed at $1.76, after exchanging 165,220 shares, Massy Holdings ended at $53.05, after exchanging 7,080 shares and Trinidad & Tobago NGL completed trading of 275 units at $29.49. 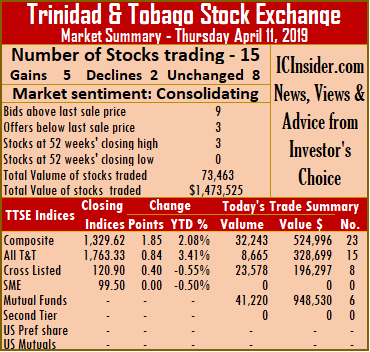 Trading on the Trinidad & Tobago Stock Exchange ended with just one stock rising, 7 declining and 8 remaining unchanged as the volume and value of trades climbed over that on Thursday. Trading ended with 16 securities changing hands, against 15 on Thursday with investors exchanging 582,066 shares for $13,484,840, compared to 244,479 shares for $4,262,247 on Thursday. The Composite Index lost 2.99 points to end at 1,330.72. 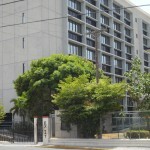 The All T&T Index declined 4.54 points to 1,771.10, while the Cross Listed Index fell 0.19 points to close at 120.11. IC bid-offer Indicator|The Investor’s Choice bid-offer ended at 6 stocks with bids higher than their last selling prices and 3 with lower offers. At the close of the market, Republic Financial Holdings rose 21 cents to $120, after exchanging 52,811 shares. Stocks closing with losses| First Citizens fell 50 cents to settle at $36, after exchanging 6,687 shares, Massy Holdings closed with a loss of 10 cents and closed at $53.30, after exchanging 1,821 shares, NCB Financial Group shed 1 cent and settled at $8.24, with the trading of 200 shares. Sagicor Financial lost 15 cents in exchanging 55,520 shares to close at $8.65, Scotiabank ended trading at 51 cents lower at $63, with 1,452 stock units changing hands, Trinidad & Tobago NGL concluded trading with a loss of 77 cents at $29.50, with 130,367 units trading and Trinidad Cement fell 5 cents and settled at $2.60, after exchanging 13,319 shares. Stocks closing firm| Angostura Holdings ended at $16, with 5 stock units changing hands, Clico Investments ended at $23, trading 75,283 stock units, Grace Kennedy ended at $3.30, with an exchange of 39,345 stock units, JMMB Group closed at $1.76, after exchanging 202,426 shares. 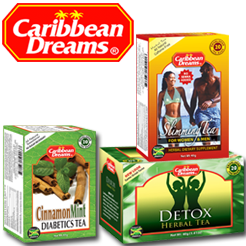 One Caribbean Media concluded trading of 1,100 shares at $10.10, Point Lisas closed at $3.45, with 247 stock units changing hands, Unilever Caribbean ended at $26.30, after trading 1,311 shares and West Indian Tobacco ended at $98.75, with 172 stock units changing hands. First Citizens Bank traded at 52 weeks’ high on Thursday. 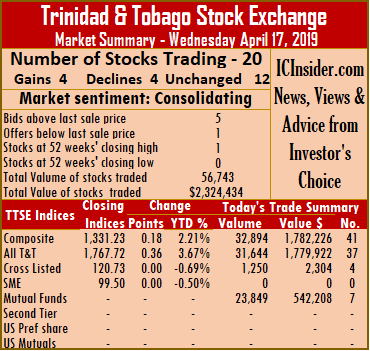 Three securities closed at 52 weeks’ high as the Trinidad & Tobago Stock Exchange quietly continue to move higher with the All T&T Index rising more than 4 percent for the year to date. Trading ended with 15 securities changing hands, against 10 on Wednesday with investors exchanging 244,479 shares for $4,262,247, compared to 80,535 shares for $942,914 on Wednesday. IC bid-offer Indicator|The Investor’s Choice bid-offer ended at 5 stocks with bids higher than their last selling prices and 2 with a lower offer. At the close of the market, stocks ending trading with gains| Angostura Holdings gained 20 cents to end at $16, with 306 stock units changing hands, Clico Investments finished 30 cents higher at $23, trading 108,409 stock units, First Citizens climbed 45 cents and settled at a 52 weeks’ high of $36.50, after exchanging 404 shares. Republic Financial Holdings added 29 cents and settled at $119.79, after trading just 20 shares, Scotiabank increased 50 cents and ended at $63.51, with a mere 35 stock units changing hands, Trinidad Cement rose 5 cents to $2.65, after exchanging 1,000 shares and Unilever Caribbean closed with a gain of 30 cents at $26.30, after swapping 10,482 shares. 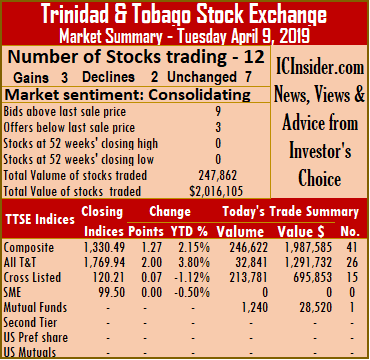 Stocks closing losses| JMMB Group fell 2 cents at $1.76, after exchanging 41,500 shares and Trinidad & Tobago NGL closed with a loss of 23 cents and completed trading 33,763 units at $30.27. Stocks closing firm| CinemaOne ended at $9.95, with 376 stock units changing hands, First Caribbean International Bank completed trading with 30,404 units at $8.25, National Flour exchanged 2,601 shares at $1.65. NCB Financial Group settled at $8.25, after exchanging 5,290 shares, Sagicor Financial closed at $8.80, after trading 10,250 shares and West Indian Tobacco ended at $98.75, with 15 stock units changing hands.